Marco and Ristretto at TEDGlobal 2012 – episode 1 – The Preparation - Marco Beverage Systems Ltd. I hope you’re all keeping well. A few weeks ago we had the pleasure of inviting Kas from Waterloo Tea to do a guest blog on his experiences at TEDGlobal. It was well received so we’ve asked Joseph O’Hara from Ristretto to blog about his experiences at TEDGlobal and share them with us. Ristretto was fortunate to be asked to provide the coffee service for the delegates at TEDGlobal 2012 in Edinburgh earlier this year. For those of you who don’t know what TED is, its an international conference running since 1984 that brings people together from the worlds of Technology, Entertainment and Design. Their mission: Spreading ideas. This year TEDGlobal 2012 was a four-day conference held at the Edinburgh International Conference Centre with about 800 delegates attending. While Ristretto is very experienced providing coffee services for clients at exhibitions and events all over Europe, this was our first time providing coffee for TED – and we weren’t initially quite sure what was required. Previously the coffee had been provided by Coffee Common (http://www.coffeecommon.com) but they were unable to provide the service this year. Waterloo Teas was providing the teas as they did last year but were looking for an expert partner to provide the coffee so just two weeks before the event, Ristretto were asked to come and brew. What we knew was that we would have to provide the coffee service across the two main bars; one on each floor, as well as provide bulk-filter coffee on five self-service points over three floors (previously supplied by the venue rather than Coffee Common). This year we really wanted to show the delegates that bulk filter doesn’t have to be bad filter. 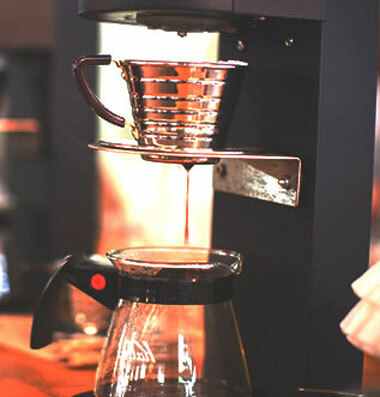 With great equipment and great coffee you can make delicious filter – lots of it. The nature of the “coffee service” was not really defined – so we set out to define it ourselves. We wanted to have espresso based coffees, but also bring handmade per-cup filter coffees to provide a personalised service and selection. We naturally wanted the quality of the coffee served to match our motto “Making Exceptional Coffee Possible” – but we also wanted to incorporate the theme of TEDGlobal 2012 – “Radical Openness”. We thought that the best way to be open was to present an international selection of single farm coffees – no blends, so the impact of variety, geography and processing on the coffee would be as transparent as possible. We now had a plan – and two weeks to execute it. The best way to talk to all of our great suppliers on a short deadline was to get them all in one room at the same time – luckily the SCAE World of Coffee was about to start in Vienna, so I boarded a plane and off I went – for just two hours in Vienna! I needed to organise the following – Espresso machines, filter equipment, water boilers, brew bar equipment, coffee and milk. We were very lucky that we had invested in extra equipment this year to meet a growing demand so we were able to arm ourselves with a fantastic setup for the espresso bars – four gleaming white La Marzocco FB80 manual paddle espresso machines – no buttons for our baristas. We already had our machines. In my first ten minutes at the show, Guido Bernardinelli, the manager of the manufacturer La Marzocco http://www.lamarzocco.com/ from just outside Florence in Italy, generously came up with a sponsorship offer to assist us in meeting our costs – we were off to a flying start. We decided to brew The El Salvador Finca la Fany as our daily house espresso with different single-farm coffees from the above selection every day. The Filter bars, meanwhile, were to showcase two of the selection each day – with the last day a ‘baristas choice’ – three favourites from the previous days. Now we had the coffee and espresso machinery sorted, we had to sort out the filter brewing equipment to meet our demands. We had a plan to serve filter coffee from both the Aerobie Aeropress and the Hario V60 pourover on the brew bars on each floor. I headed to the Hario stand for a chat with Ryohei Uno. Hario have provided their fantastic brewing equipment to TED in the past and this year was no different. Through Hario and their distributor in the UK, CoffeeHit (www.coffeehit.co.uk), we were able to secure all the pouring kettles, V60 pour overs, range servers and woodnecks that we would need (you really should look these things up – they are perfect for home). Next solution required: self-serve filter stations. We wanted to show that larger scale production of filter coffee could still be counted on to produce a fantastic cup. All too often we meet people who are prejudiced against filter coffee – thinking of it as cheap stale coffee that has been stewing on a warming plate for hours. It doesn’t have to be this way! I headed for the Marco Beverage Systems stand. We needed bulk filter brewers for the five self-service stations and water boilers for the hand brewed filter coffees. Marco have all the products we needed. Marco’s manager Paul Stack and their marketing director Cathal Burke were very helpful once we explained what we were trying to do. Between us we decided on the Marco Filtro shuttle that brews 6 litres of filter coffee into an insulated urn. This is a great way to brew bulk filter for larger requirements. The Tanzania Blackburn Estate in particular was absolutely amazing when brewed through the Filtro Shuttle. We settled on three boilers for the hand-brewed coffee. Two Marco Eco boilers under the counter with an Uber font and a counter top Eco boiler gave us access to three different temperatures of water to really match the water temperature to each coffee. This is a very dynamic and flexible setup – the two under counter boilers and Uber font is our preferred setup for our new café in London. The planning was coming together, but we wanted to do something special with the milk for this event. We had worked with Morten Münchow (from Kontra and the University of Copenhagen) a number of times before. Morten runs a three-day roasting course for the London School of Coffee – the last day of which is held at our roastery on our 12 kg Probat. Morton has been working on Barista milk with Cafemaelk.dk – milk developed especially for cafes. The milk is 1.5% fat with a very specific processing that ensures protein content more suitable for consistent texturing on an espresso machine. We emailed Morten to see if there was any chance of using Cafemaelk for the TEDsters. A few days of looking at the logistics with the dairy, and Morten came up trumps. There is no better sight for a company that provides a service like ours in remote locations than to see a truck arrive on site with 1000 litres of Cafemaelk to fuel your lattes and cappuccinos for the week. In the week before the event, all the pieces began to come into place – green coffee arrived, machines were prepped by our engineering manager Dylan Sedgewick, coffee was roasted by Alchemy Coffee’s Nick Craven-Kalber, boilers and brewers arrived, hand brewing equipment arrived and a lovely big Ditting grinder from Ed Gooding (Mahlkoeig/Ditting) also showed up. Everything was loaded onto a 7.5 tonne truck for the long, slow journey, speed-restricted to 56 m/h, up to Edinburgh – we were on our way.